"Time in its irresistible and ceaseless flow carries along on its flood all created things and drowns them in the depths of obscurity." 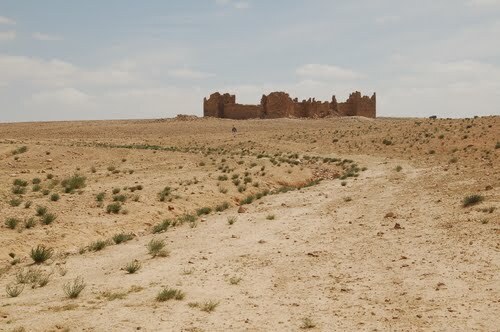 The Roman - Byzantine Fortress of Qasr Bashir in Jordan. The Limes Arabicus was a desert frontier of the Roman Empire, in the province of Arabia Petraea. It ran -at its biggest extension- for about 1,500 km, from Northern Syria to Southern Palestine and northern Arabia, forming part of the wider Roman limes system. It had several forts and watchtowers. The reason of this defensive "Limes" was to protect the Roman "Province of Arabia" from attacks of the barbarian tribes of the Arabian desert. Next to the limes arabicus Trajan built a major road, the Via Nova Traiana, from Bostra to Aila on the Red Sea, a distance of 267 miles. Built between 111 and 114 AD, its primary purpose may have been to provide efficient transportation for troop movements and government officials. It was completed under Hadrian. During the Severan dynasty (AD 193-235), the Romans strengthened their defenses on the Arabian frontier. 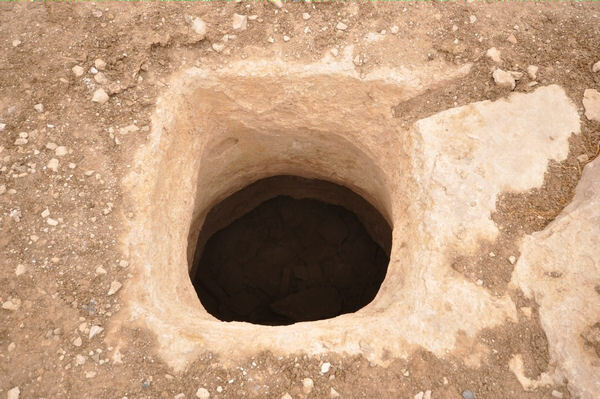 They constructed several forts at the northwest end of the Wadi Sirhan, and they repaired and improved roads. Reproduced from: Campbell DB, Roman Auxiliary forts 27 BC - AD 378. Fortress Series 83. Osprey Military Publishing, 2009. P. 58. In Jordan there was no natural boundary other than desert all the way down to the Red Sea. 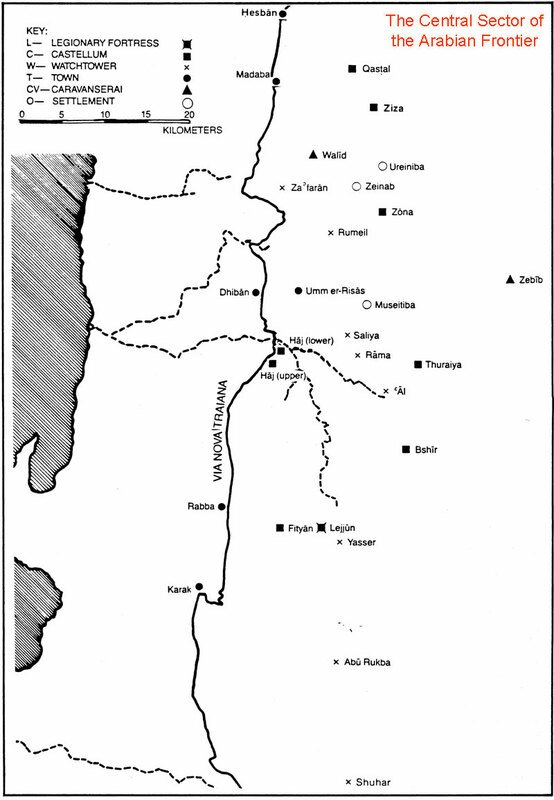 Major communication routes here tended to run between oases and along the seasonal wadis. 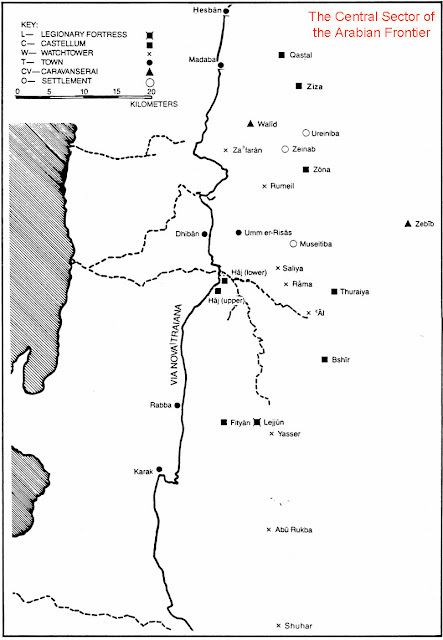 Linking Syria to the Arabia, the cities of the Decapolis, Petra and the ultimately the Gulf of Aqaba was the route known in the Bible as the King's Highway, parts of which came to be incorporated in the via nova Traiana, across which the Roman military presence was distributed. Indeed the frontier here has long been recognised as more a zone than a delineated line and where the environment played an important part in the settlement pattern. In the province of Arabia there was the less tangible but increasingly important rise of tribal confederations of nomads with whom Rome had to treat and who in time became partners in the defence of the later empire. With the annexation of Nabataean Arabia The Romans transferred the Legio III Cyrenaica from Egypt to the new province with auxiliaries. In 106 the unit was maybe based in Bostra, with the likelihood that smaller vexillations with other auxiliary units were distributed among the various cities and towns of Nabataea. At the same time some new forts were erected together with the construction of a well-known pre-Roman road, the via nova Traiana, which linked Aqaba on the Arabian Gulf to the province of Syria in the north. Various units were stationed along and behind the desert line east of this main transfer road. In the early 3rd century significant construction work was done, probably in the Severan period. Pushing out in to the desert regions in north-east Arabia to control the oases with the erection of new forts and new road building. The emperor Diocletian's army reform around 300 also affected the form and distribution of Roman military installations. 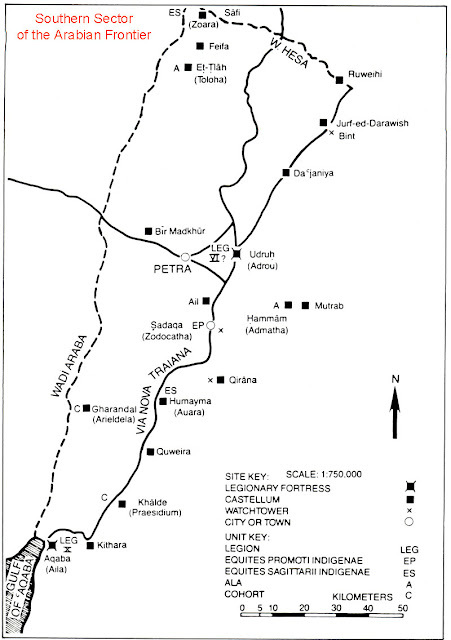 About this time the Roman army constructed three new but smaller legionary sites in Betthorus-Lejjun, Adrou-Udruh and Aila-Aqaba and smaller sized other forts. Most of those garrisons were still maintained in many of the locations into the 4th century and only successively reduced to be compensated with greater use of control exerted through diplomacy and subsidy with the leaders of the local nomadic population. In AD 106 the Romans under Emperor Trajan achieved control of the region east of the Jordan River, which was previously ruled by the Nabataeans. Until then, the Nabataean kingdom had provided a buffer between the Roman Empire and the threat of enemies to the east. Historians do not know how and why the Romans took direct control. Perhaps the lack of a legitimate successor to the deceased Nabataean king resulted in a power vacuum. The Romans annexed the area and called it Provincia Arabia. It was governed by a senatorial legate appointed by the emperor, and its capital was Bostra (or Bosra) in southern Syria. Qasr Bashir is an extremely well preserved Roman fortress that lies in the Jordanian desert. 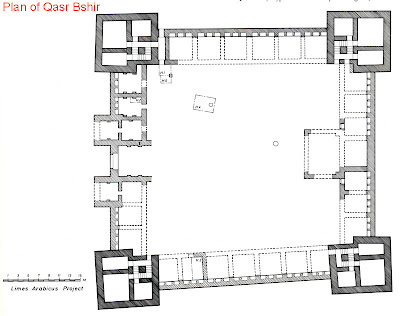 Unlike many Roman remains, Qasr Bashir is exceptionally well preserved, having never been re-built by later civilizations. 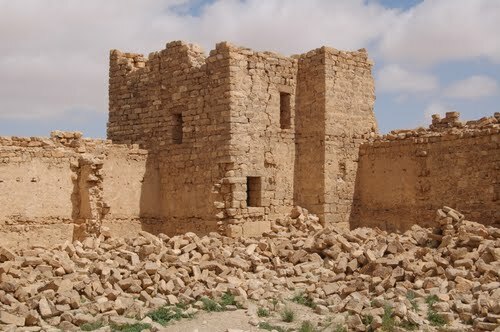 Qasr Bshir belongs to the chain of forts and watchtowers that is known as the Limes Arabicus and was meant to protect the province of Arabia against roaming desert nomads. They were not extremely dangerous or exceptionally violent, but their dromedaries made them swift, and if trouble arose, they could pillage large parts of the Roman countryside. 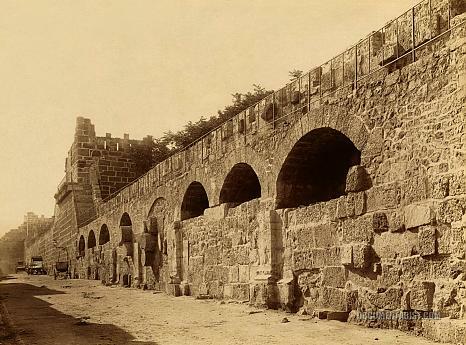 The Limes Arabicus had to counter this threat, and Mobene was one of the fortifications. 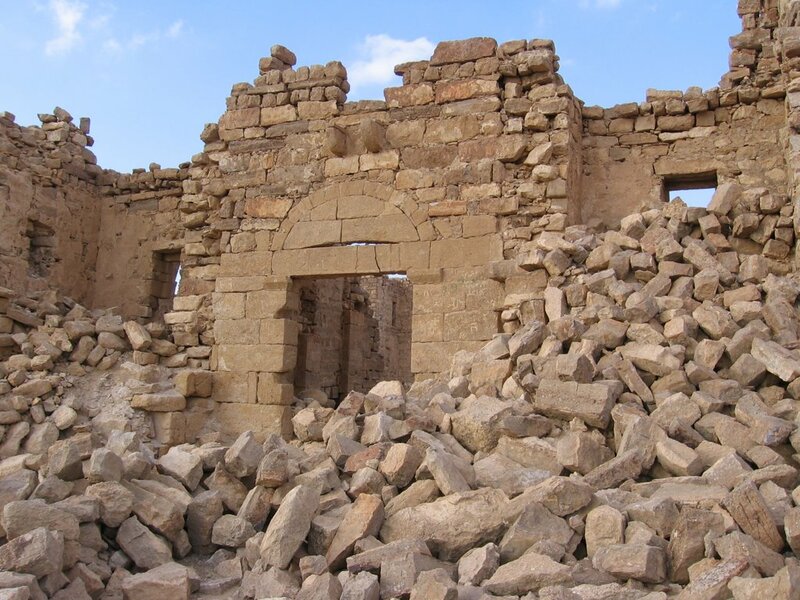 Built at the beginning of the fourth Century AD and known as Mobene, the walls of Qasr Bashir still stand intact, at a height of up to 20 feet in places, while the main entrance remains to this day. The huge corner towers still rise up two stories from the ground. 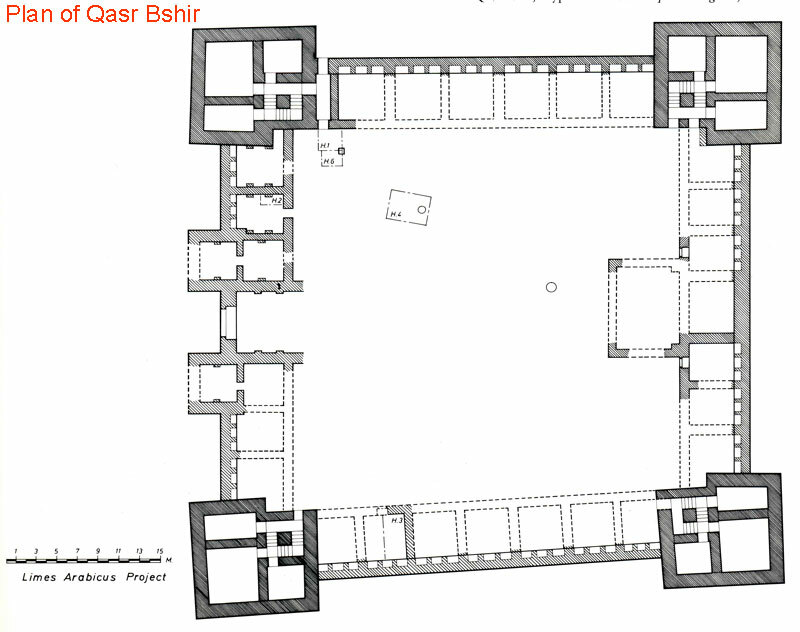 It is likely that Qasr Bashir was originally home to an auxiliary cavalry unit, charged with defending the Roman frontier and keeping the peace in the surrounding area. The courtyard, which has two cisterns, is on all sides surrounded by rooms, twenty-three in number, which have been identified as stables. There was a second story, where the soldiers must have slept. The roof of these barracks reached the same height as the rampart walk, creating a really wide fighting platform. One room, opposite the main gate, may have been the headquarters, some kind of sanctuary, or both. Because each of the twenty-three stables was used by three horses, and because a cavalry unit of frontier soldiers appears to have numbered between 120 and 150 men. The Roman Limes defense system. 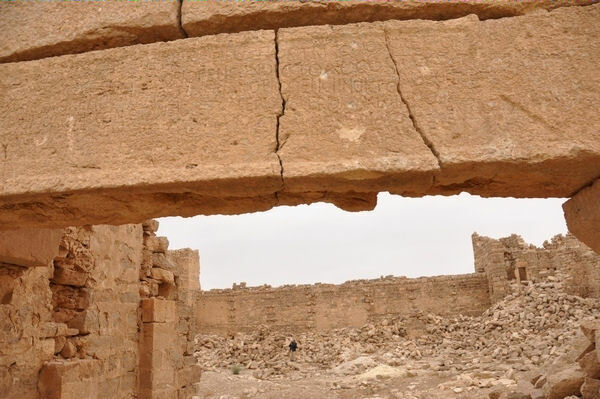 The short film The Roman Frontier in Jordan is part of the multimedia DVD-project Frontiers of the Roman Empire. The aims of the film are to show fascinating pictures from the Roman frontier in the Middle East and to connect people from different countries through their common history and archaeology. 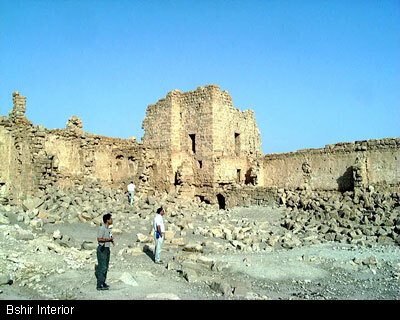 The Roman fort of Qasr Bshir is one of the best preserved installation of the Roman army known today. 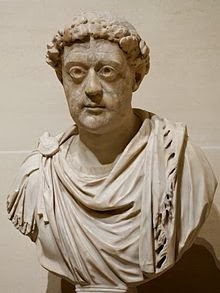 In honor of our best and greatest rulers, Gaius Aurelius Valerius Diocletian, our pious, lucky, and unconquered emperor, and Marcus Aurelius Valerius Maximian, our pious, lucky, and unconquered emperor, and to Flavius Valerius Constantius and Galerius Valerius Maximianus, our noblest caesars, has Aurelius Asclepiades, praeses of the province of Arabia, ordered to build Castra Praetorium Mobene from its foundations. This inscription allows us to date the construction of the fort to 293-305, when the Romans constructed more forts in this sector of the frontier. The Roman military presence in Arabia began to decline in the mid-400s when forces were diverted to other threatened frontiers. In the early 500s, Justinian turned over the defense of the southeastern frontier to the Ghassanids, a Christian Arab tribe. Around AD 530, the troops were withdrawn and the limes Arabicus ceased to exist. The forts of el-Lejjun, Khirbet el-Fityan, Rujm Beni Yasser, Qasr Bshir, and Da'janiya were abandoned at this time. 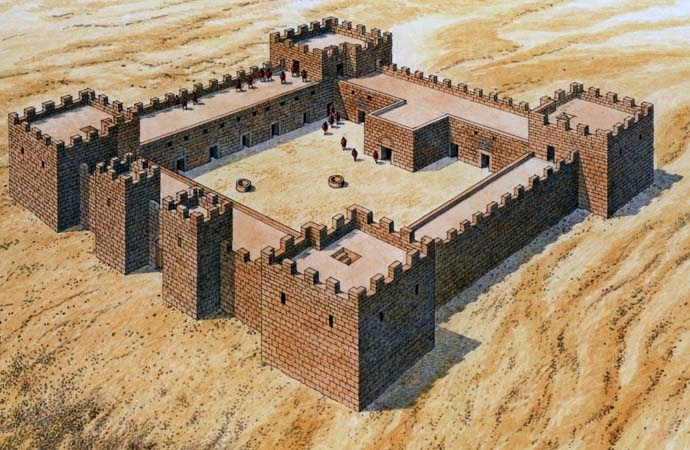 The numerous watchtowers provide no evidence of occupation in the sixth or early seventh centuries. At least by the early 600s, the fortified frontier system in Palestine and Transjordan no longer existed. 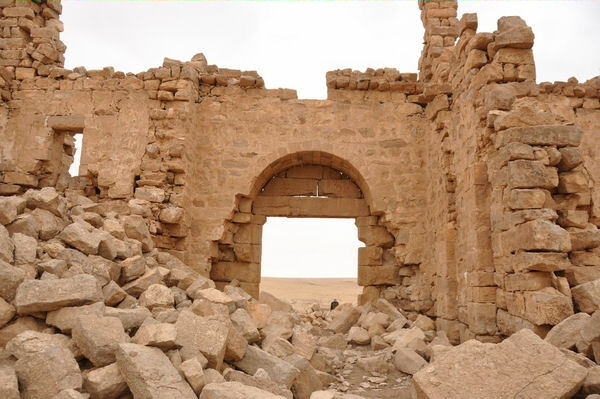 This withdrawal of defenses paved the way for the eventual Muslim conquest of the region in the 600s. 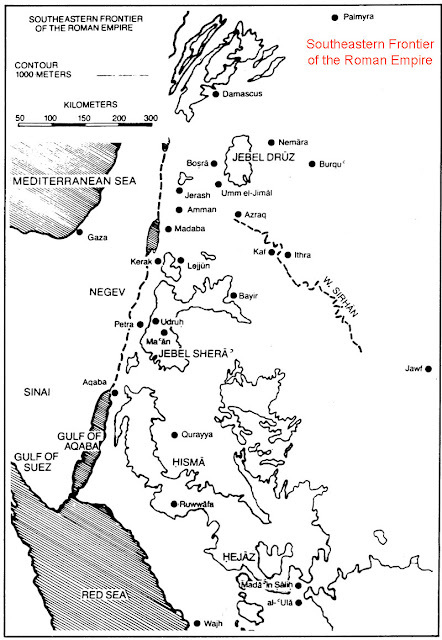 The frontier zone south of Wadi al-Hasa was called the limes Palaestina, which extended to the Red Sea at Aila ('Aqaba). In this region, ten castella and a legionary camp have been identified. Diocletian engaged in a major military expansion in the region, building a number of forts (castella), watchtowers, and fortresses along the fringe of the desert just east of the Via Nova. The term used for this north-to-south line of military installations is limes Arabicus, which means "Arabian frontier." This line of defense extended from south of Damascus to Wadi al-Hasa. 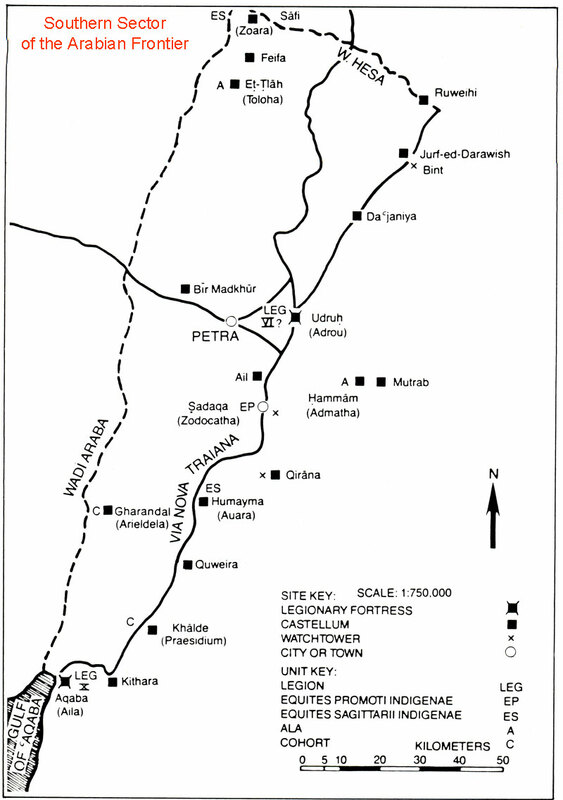 The region from Wadi Mujib to Wadi al-Hasa contained four castella and a legionary camp. amanfrommoab, Thanks for the post. In error I deleted you. Never blog when you are not awake yet. Like individuals, nations are born and die; but civilization can not die. Government - Did Taxes Cause the Fall of Rome? Emperor 408 to 450. Known for the Theodosian law code, and the construction of the Theodosian Walls of Constantinople. When Roman Africa fell to the Vandals in 439, both Eastern and Western Emperors sent forces to Sicily, to launch an attack at the Vandals at Carthage, but this project failed. Emperor from 457–474. He was born Leo Marcellus in Thracia or in Dacia Aureliana province in the year 401 to a Thraco-Roman family. He served in the Roman army, rising to the rank of comes. Leo is notable for being the first Eastern Emperor to legislate in Greek rather than Latin. He worked to liberate North Africa from the Vandals with an expedition in 468 of 1,113 ships carrying 100,000 men, but in the end lost 600 ships. Emperor 527 to 565. 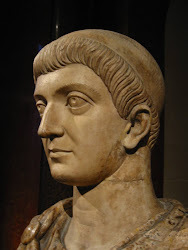 Justinian was the last Roman Emperor to speak Latin as a first language. Justinian's reign is marked by the ambitious but only partly realized renovatio imperii, or "restoration of the Empire". His general Belisarius conquered the Vandal Kingdom in North Africa, extending Roman control to the Atlantic Ocean. 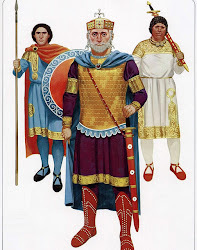 Subsequently Belisarius, Narses, and other generals conquered the Ostrogothic Kingdom, restoring Dalmatia, Sicily, Italy, and Rome to the Empire after more than half a century of barbarian control. The prefect Liberius reclaimed most of southern Iberia, establishing the province of Spania. Under his rule there was a uniform rewriting of Roman law, the Corpus Juris Civilis, which is still the basis of civil law in many modern states. His reign also marked a blossoming of Byzantine culture, and his building program yielded such masterpieces as the church of Hagia Sophia. Emperor from 582 to 602. A prominent general in his youth, Maurice fought with success against the Sassanid Persians. Once he became Emperor, he brought the war with Persia to a victorious conclusion: the Empire's eastern border in the Caucasus was vastly expanded and for the first time in nearly two centuries the Romans were no longer obliged to pay the Persians thousands of pounds of gold annually for peace. Maurice campaigned extensively in the Balkans against the Avars – pushing them back across the Danube by 599. He also conducted campaigns across the Danube, the first Emperor to do so in over two hundred years. In the West, he established two large semi-autonomous provinces called exarchates, ruled by exarchs, or viceroys, of the Emperor. Maurice established the Exarchate of Ravenna, Italy in 584, the first real effort by the Empire to halt the advance of the Lombards. With the creation of the Exarchate of Africa in 590, he further solidified the empire's hold on the western Mediterranean. Emperor 610 to 641. Heraclius' reign was marked by several military campaigns. The year Heraclius came to power the Empire was threatened on multiple frontiers. Heraclius immediately took charge of the ongoing war against the Sassanid Persians. The first battles of the campaign ended in defeat for the Byzantines; the Persian army fought their way to the Bosphorus. However, because Constantinople was protected by impenetrable walls and a strong navy, Heraclius was able to avoid total defeat. 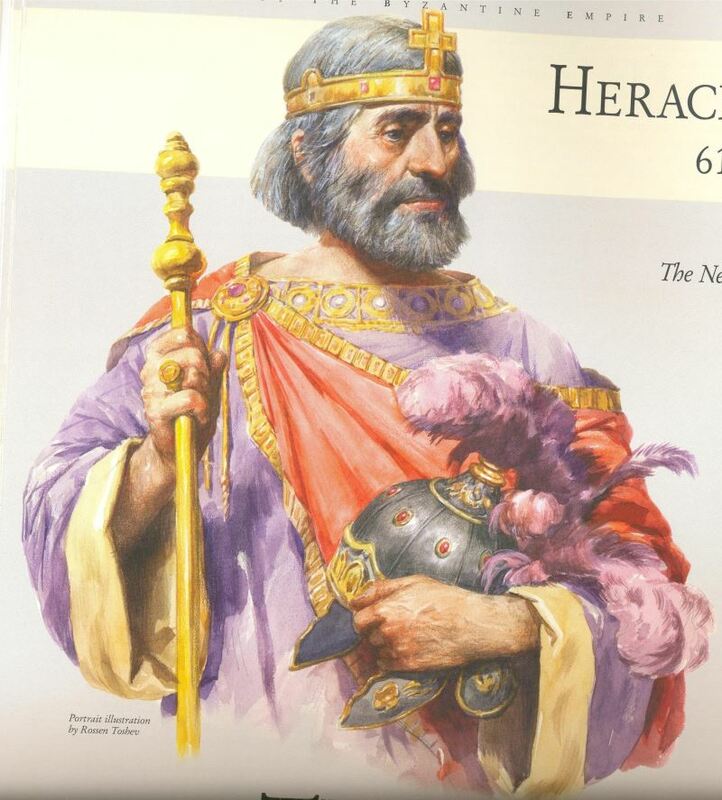 Heraclius drove the Persians out of Asia Minor and pushed deep into their territory, defeating them decisively in 627 at the Battle of Nineveh. Soon after his victory he faced a new threat of the Muslim invasions. In 634 the Muslims invaded Roman Syria, defeating Heraclius' brother Theodore. Within a short period of time the Arabs would also conquer Mesopotamia, Armenia, and Egypt. 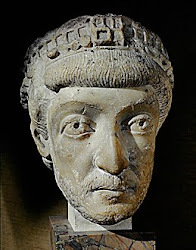 Constantine IV - "The Bearded"
Emperor 668 to 685 AD. His reign saw the first serious check to nearly 50 years of uninterrupted Islamic expansion. 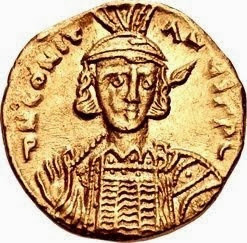 Constantine organized the Empire for the massive First Arab Siege of Constantinople in 674–678. If Constantinople had fallen all of Europe would have been open to Islamic invasion. Emperor 717 to 741. Defended the Empire during the Second Siege of Constantinople against an invading Arab army of 80,000 men and a fleet of over 2,500 ships. Leo reformed the laws with the elevation of the serfs into a class of free tenants. Leo began the iconoclast campaign. Irene of Athens Byzantine Empress Regnant from 797 to 802. Prior to becoming Empress regnant, Irene was empress consort from 775 to 780, and empress dowager and regent from 780 to 797. It is often claimed she called herself basileus 'emperor'. In fact, she normally referred to herself as basilissa, 'empress', although there are three instances of the title basileus being used by her. Irene was born to the noble Greek Sarantapechos family of Athens. She married Leo IV in 769. 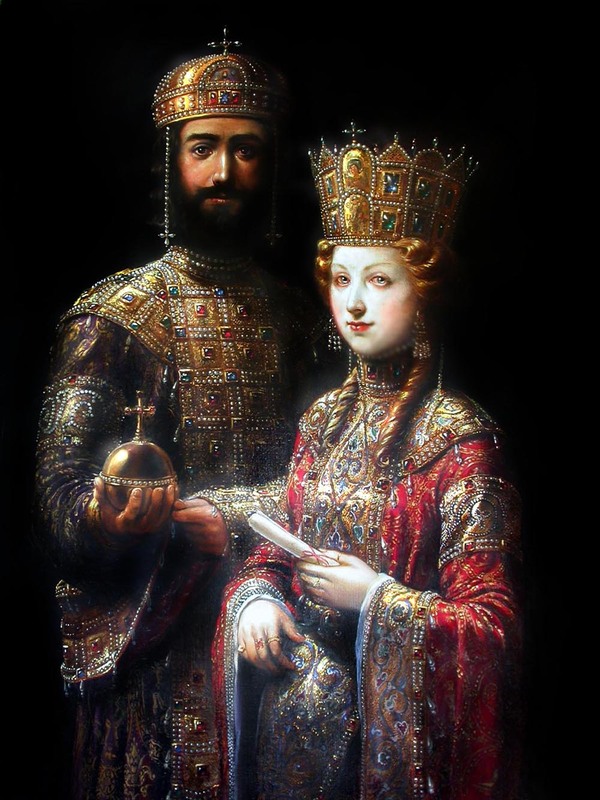 Upon Leo's death she became regent for the future Constantine VI. Irene was almost immediately confronted with a conspiracy against her close to home and in Sicily. 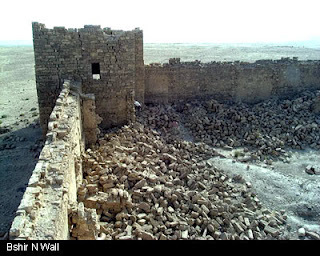 Irene withstood an invasion by a large Arab army. She subdued the Slavs of the Balkans and laid the foundations of Byzantine expansion and re-Hellenization in the area. 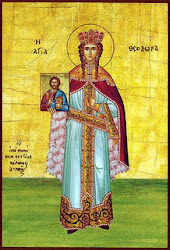 Irene's most notable act was the restoration of the Orthodox veneration of icons (images of Christ or the saints). 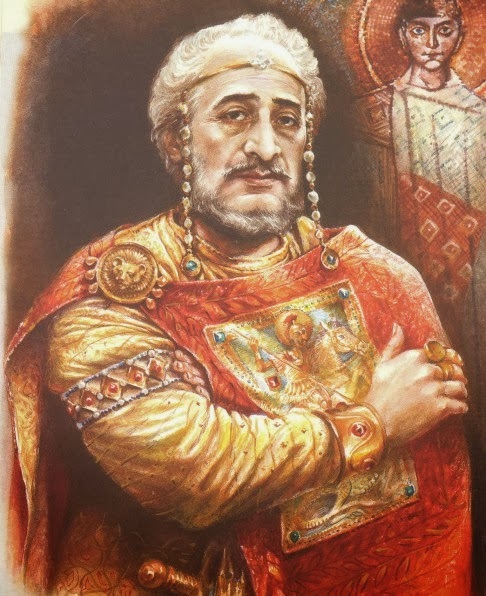 Pope Leo III, who needed help against enemies in Rome and who saw the throne of the Byzantine Emperor as vacant (lacking a male occupant), crowned Charlemagne as Roman Emperor in 800. 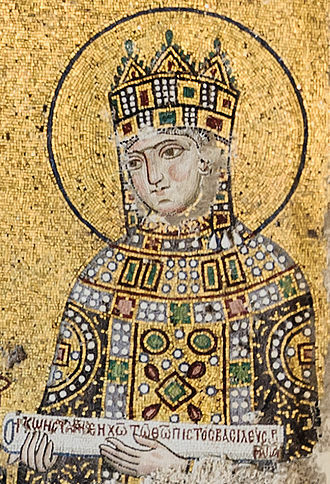 Empress as the spouse of the Byzantine Emperor Theophilos, and regent of her son, Michael III, from Theophilos' death in 842 to 855. She carried on the government with a firm and judicious hand, and replenished the treasury. The Empress organized the Roman navy and army in multi-front wars against the Arabs and deterred the Bulgarians from an attempt at invasion. Emperor from 963 to 969. His brilliant military exploits resulted in the conquest of Cilicia and the re-conquest of the island of Cyprus from the Muslims. He conducted raids into Upper Mesopotamia and Syria. In the West he lost Sicily completely to the Muslims and faced Magyar raids deep into the Balkans. He was assassinated in his apartment on December 11, 969. On the night of the assassination the Empress Theophano suspiciously left the Imperial bedchamber, leaving the doors unbolted. General John Tzimiskes entered, killed the Emperor, and then declared himself Emperor. It was thought the General and the Empress had been lovers. Emperor 976 to 1025. Basil oversaw the stabilization and expansion of the Byzantine Empire's eastern frontier, and above all, the final and complete subjugation of Bulgaria, the Empire's foremost European foe, after a prolonged struggle. For this he was nicknamed by later authors as "the Bulgar-slayer" by which he is popularly known. At his death, the Empire stretched from Southern Italy to the Caucasus and from the Danube to the borders of Palestine, its greatest territorial extent since the Muslim conquests four centuries earlier. Zoë (c. 978 – June 1050) reigned as Byzantine Empress alongside her sister Theodora from April 19 to June 11, 1042. She was also enthroned as the Empress Consort to a series of co-rulers beginning with Romanos III in 1028 until her death in 1050 while married to Constantine IX. 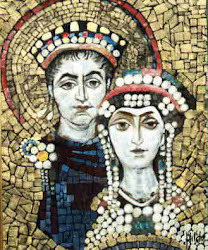 Theodora and Zoë appeared together at meetings of the Senate. Theodora was the junior empress, and her throne was situated slightly behind Zoë’s in all public occasions. Emperor from 1118 to 1143. The greatest of the Komnenian emperors. In the course of his twenty-five year reign, John made alliances with the Holy Roman Empire in the west, decisively defeated the Pechenegs in the Balkans, and personally led numerous campaigns against the Turks in Asia Minor. John's campaigns fundamentally changed the balance of power in the east, forcing the Turks onto the defensive and restoring to the Byzantines many towns, fortresses and cities right across the peninsula. In the southeast, John extended Byzantine control from the Maeander in the west all the way to Cilicia and Tarsus in the east. In an effort to demonstrate the Byzantine emperor's role as the leader of the Christian world, John marched into Muslim Syria at the head of the combined forces of Byzantium and the Crusader states. Reigned as Emperor 1259–1282. 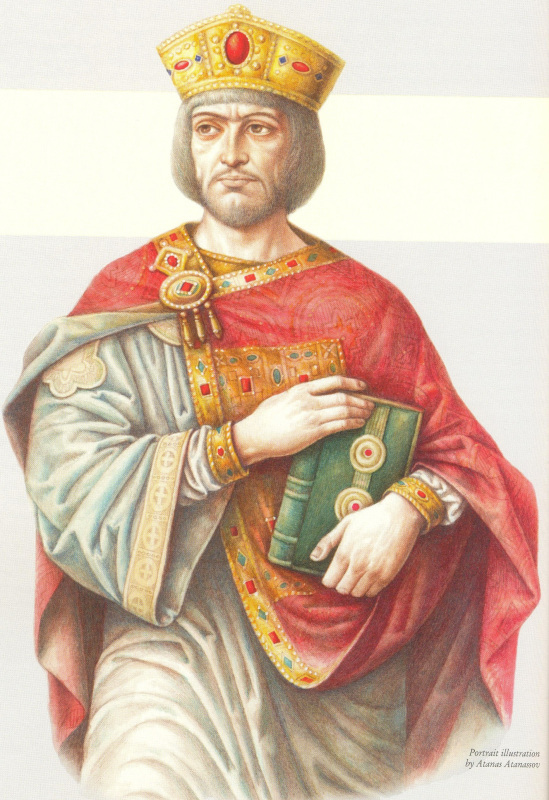 Michael VIII was the founder of the Palaiologan dynasty that would rule the Empire until the Fall of Constantinople in 1453. 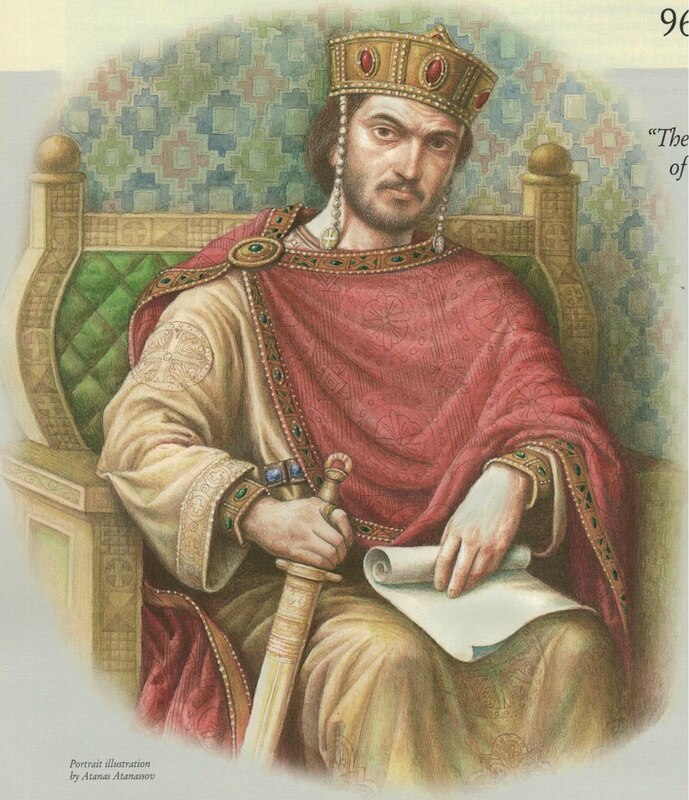 He recovered Constantinople from the Latin Empire in 1261 and transformed the Empire of Nicaea into a restored Roman Empire. During his reign there was a temporary naval revival in which the Byzantine navy consisted of 80 ships. The Last Emperor of the Romans 1449 to 1453. Constantine faced the siege of Constantinople defending his city of 60,000 people with an army only numbering 7,000 men against an Ottoman army of over 80,000. He personally led the defense of the city and took an active part in the fighting alongside his troops in the land walls. At the same time, he used his diplomatic skills to maintain the necessary unity between the Genovese, Venetian and the Greek troops. When the city fell to the Turks he tore off his imperial ornaments so there would be nothing to distinguish him from any other soldier and led his remaining soldiers into a last charge where he was killed. 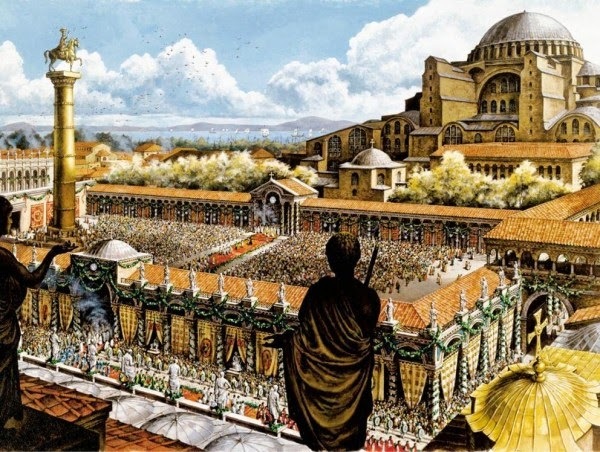 Founded by by Constantine the Great in 324 AD, Constantinople was the captial of the the Eastern Roman Empire and the center of Western civilization for centuries. The 6th century Byzantine walls, popularly known as "Solomon's Walls" and flanked by thirteen square towers.Tebessa, Algeria. At its peak the Empire stretched from Morocco and Spain to Italy, Egypt, the Euphrates River, the Caucasus Mountain to the Danube River. 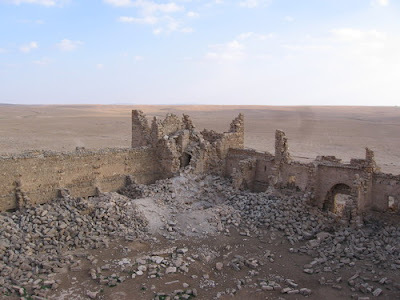 The citadel of the Roman-Byzantine fortress of Zenobia near Halabiye, Syria. 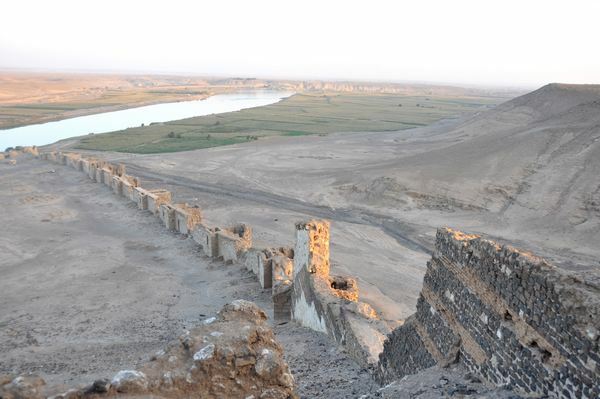 View from the southern wall looking down to the Euphrates River. The Castle of Sant'Aniceto (also San Niceto) is an Eastern Roman Empire castle built in the early 11th century on a hill in Motta San Giovanni, now in the province of Reggio Calabria, southern Italy. It is one of the few examples of High Middle Ages architecture in Calabria, as well as one of the few well-preserved Byzantine fortifications in the world. The name derives from that of St. Nicetas, a Eastern Roman admiral who lived in the 7th-8th centuries. The castle is one of the few Byzantine fortifications subjected to the work of restoration and recovery. The Byzantine Fortress of Tureta in Croatia. 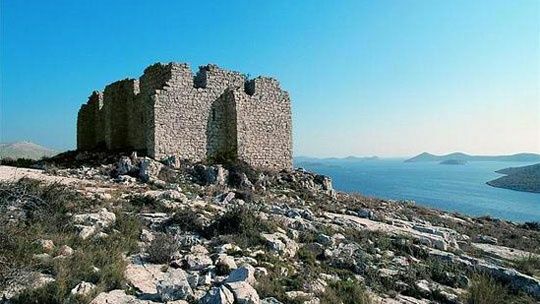 The fortress is the most significant structure on the Kornati islands dating from the Byzantine period. It is located on the island of Kornat and was probably built in the 8th century. It is assumed that the fortress was built up for military purposes to protect and control the navigation in this part of the Adriatic Sea. Saint Catherine's Monastery lies on the Sinai Peninsula, Egypt. The fortified monastery was built by the Byzantine Emperor Justinian in the 6th century AD, although there was already a church at the site erected by the Empress Helena in 330 AD. The Monastery also has a copy of the Achtiname, in which Muhammad bestowed his protection upon the monastery. Angelokastro or "Castle of the Angels" is one of the most important Byzantine castles of Greece. 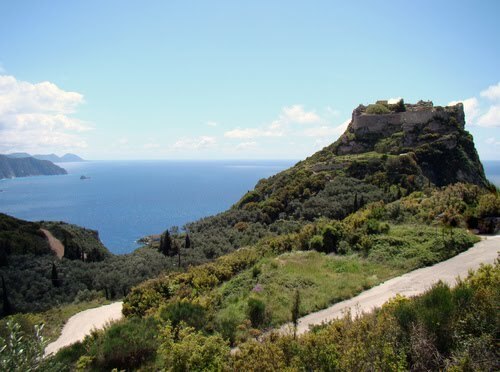 It is located on the island of Corfu at the top of the highest peak of the island's shoreline in the northwest coast near Palaiokastritsa and built on particularly precipitous and rocky terrain. It stands 1,000 ft (305 m) on a steep cliff above the Ionian Sea and surveys the City of Corfu and the mountains of mainland Greece to the southeast and a wide area of Corfu toward the northeast and northwest. 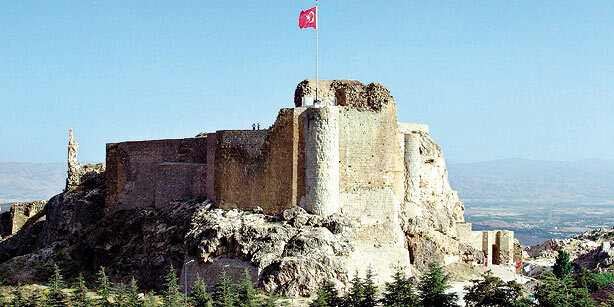 The Roman-Byzantine Castle of Harput in Anatolia. The strong point Harput was part of both the Roman and Byzantine defensive systems. Eastern Anatolia saw many huge military campaigns from Roman to Byzantine times. This area was involved in multiple wars with the Persian Empire, Arabs and Turks. FAIR USE NOTICE: This site contains copyrighted material the use of which has not always been specifically authorized by the copyright owner. We are making such material available in an effort to advance understanding of environmental, political, human rights, economic, democracy, scientific, and social justice issues, etc. We believe this constitutes a 'fair use' of any such copyrighted material as provided for in section 107 of the US Copyright Law. In accordance with Title 17 U.S.C. Section 107, the material on this site is distributed without profit to those who have expressed a prior interest in receiving the included information for research and educational purposes. UNDER SECTION 107 OF COPYRIGHT ACT OF 1976 ALLOWANCE IS MADE FOR 'FAIR USE" FOR PURPOSES SUCH AS CRITICISM,COMMENT,NEWS REPORTING,TEACHING,SCHOLARSHIP AND RESEARCH. FAIR USE IS PERMITTED BY COPYRIGHT STATUE THAT OTHERWISE BE INFRINGING. NON-PROFIT,EDUCATION AND PERSONAL TIPS THE BALANCE IN FAVOR OF FAIR USE . . .